Didn't stay in the hotel, quite clean but as the other poster said, rent from the low rise accomodation further down. Spacious, well furnished and no hassle. Yalta is a mixture of a hotel, and private apartments. I havent been to the hotel as a guest, but I have had a few drinks and lunch at there.It was alright. I would recommend renting one of the apartments further down towards the sea. 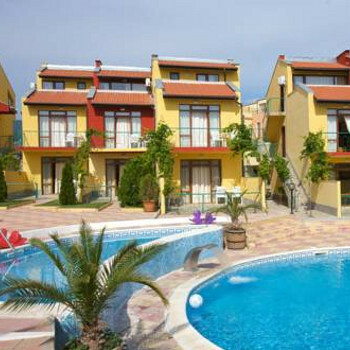 They are low rise, good size and have nice quiet pools, with no fights for a sun lounger. Sunny Beach is only a short walk away, or a long walk if you want to go all the way along the front. There are plenty of buses to get around on if you dont want to walk. St Vlas is just up the road, and is good for restaurants and small local shops. So if you want to try Yalta I wouldnt be put off by the Hotel part. The hotel itself was kept clean (with exception to the communal toilets in reception area) the cleaners came in every day. The hotel itself is a good 25 mins walk to the beach and the nightlife. So budget for a taxi home every night or a long walk up hill! The hotel staff were always around but never seemed very happy or helpful in anyway. The only time we had a smile off one of them was when our taxi turned up to take us back to the airport! The music around the pool was very loud and always the same ... you're ok if you like dance and trance music. Clearly the barmans taste in music. The only positives about the hotel was the cleanliness, the air con... and the balcony with the great views over Sunny Beach. Enjoyed the Hotel very much and would visit again next year. We had self catering apartment which was next to pool and bar. Restaurant served Bulgarian food which was excellent. We did have parking at front of Hotel and loved the area very. Five min walk to secluded beach. Would definately visit again.